Mercedes-Benz CLS made its debut in 2005 with a four-door coupe based on its E-Class. Initially offered with a V6 and V8 engines delivering 507 HP, journey till Mercedes-Benz CLS-Class 2015 remarkably showed improvement and maintained its impeccably entity in the hearts of its buyers. Let us have a go-through at the review of Mercedes-Benz CLS-Class 2015 to know the entire inside-out of model. Interior of Mercedes-Benz CLS-Class 2015 gives you a serene experience and narrates the feeling of being a sportive luxury vehicle. An eight inch color display counts to be the major amalgamation. This not only adds to infotainment but also glorifies the looks in the interior. Sitting over comfortable leather wrapped seats, driver has an all new three-spoke flat bottom steering wheel, with its vertical spokes mounted with controls and subsequently giving you a safe and full-command ride. Interior of Mercedes-Benz CLS-Class 2015 comes in five colors and six trims, making it look more personalize by suiting your mood and wish out of the listed options. 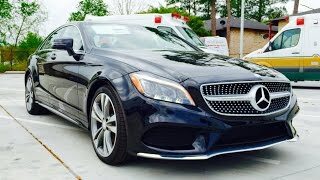 Exterior of Mercedes-Benz CLS-Class 2015 comes with fewer changes but those incorporated add to the traditional image and expectations from Mercedes. 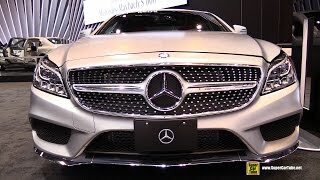 Starting with the front fascia of Mercedes-Benz CLS-Class you have new Multibeam LED headlights with incorporated daytime running lights sitting at each corner of large front grille. Beneath them is a revised bumper and new air-intakes in the lower apron. Moving towards the rear fascia of Mercedes-Benz CLS-Class 2015 change comes with rear bumper which gets a new shape apart from this rest all remains same in the exterior of Mercedes-Benz CLS-Class. 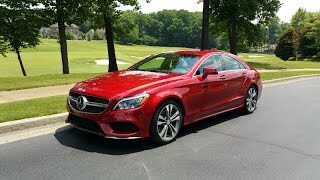 The Mercedes-Benz CLS-Class 2015 brings six powertrains in whole; starting with the lowest in line-up we have a 2.1 Liter four-cylinder turbodiesel engine delivering 170 hp and 400 nm torque, the same engine with modified power makes the second in line delivering 204 hp and peak torque of 500 nm. Third engine in this list is a 3.0 Liter V6 diesel engine delivering total output of 258 hp and peak torque of 620 nm. These three engines come with CLS 220 Blue TEC, CLS 250 Blue TEC and CLS 350 Blue TEC respectively. While completing CLS 400 and CLS 500 is a 3.0 Liter V6 biturbo engine delivering 333 hp and 480 nm and 408 hp and 600 nm respectively. Last but the most powerful comes with the CLS 63 AMG with 557 hp and 800 nm.